The Cuban government recently sent a shockwave over its people when it announced plans to cut 500,000 state workers---a tenth of the total workforce---by March 2011. “Our state cannot and should not continue maintaining enterprises with inflated payrolls, losses that pull down our economy and make us counterproductive, generate bad habits and distort worker behavior,” said a statement by the Cuban Workers’ Central (CTC). Those given their pink slips will be urged to form private small businesses, mainly in the areas of transport and house rental. Others will be pushed into foreign-run company jobs and joint ventures. The idea is that this will cut public spending and force workers to become entrepreneurs with tax-paying businesses. An internal Communist Party document states that layoffs will begin in the sugar, public health, tourism and agriculture sectors. First to go will be those whose pay is not in line with their low productivity, and those who lack discipline or are not interested in work. 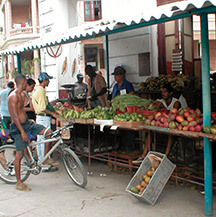 Skeptics point out that Cuba has never had a private economy under the Castro regime. Moreover, the island does not have the liquidity to support its people. Take the case of “Maria Fernandez,” who spoke to LATINO only on condition that her real name was not used, for fear of reprisal. She works as a secretary in a small clinic on the island. Her family scrapes by like thousands of other Cuban families, but she never thought of losing her job. “Cubans are underpaid, hungry and restricted,” Fernandez says. “They don’t have the money or the materials to begin forging a business, much less a business that will [support] its people.” Fernandez says that this push for entrepreneurship is “strange” because to be self-employed in Cuba was always considered “counterrevolutionary”. Now, communist media promotes the merits of private enterprise. One of the “usual suspects” is the Washington-based Cuba Study Group that has already proposed, along with Mexico’s Banco Comportamos, a $10 million microloan program for Cuban entrepreneurs. This study group is also urging the Obama Administration to change the embargo regulations and let Americans invest in private Cuban businesses. But given the Democratic loss of the House, this seems unlikely. According to Fernandez, the occupations the Cuban government is trying to privatize already exist in the black market. One reason for the push of private enterprise is to bring these people into the formal economy, and make them pay taxes.